Are you guys super excited for the new Alice in Wonderland to come out? I am. I kind of want to read the book before I see it though because it seems like the movie is going to be out of control and I'd like to create a few images in my head from my own imagination before having them skewed by Tim Burton. I'll probably see the movie first though. So, I thought in honor of the upcoming presentation, I'd do a little papercut of a scene from Alice's Adventures in Wonderland. Here she is playing croquet with a flamingo for a mallet and a hedgehog for a ball. This is what your template will look like. Remember to cut the inside areas out first. All the inside parts are shaded gray. Then cut out the outer perimeter. Enjoy! Download your free Scherenschnitt here: Alice's Adventures in Wonderland. I'm so excited for the film! I read the book in December and can't wait to see it. I'm so excited to give this template a try. Beautiful! I am VERY excited about the film...I am not overly excited about how it seems to be making everyone in crafty blog world use the (already overused) word "whimsy" way too much. Thank you for not using any form of it in this post. And thank you for the template- you're work is really beautiful. 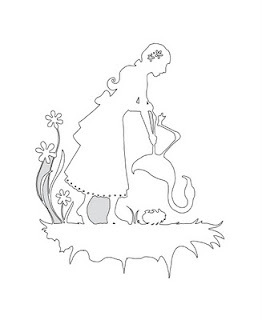 Thank you so much for another Alice papercut. On the weekend I picked up a copy of 'Paper Cuts' as soon as I flicked through and saw your tea party papercut. I made it on the weekend and it now takes pride of place on our dining table. I just got back from seeing the movie and LOVED it! 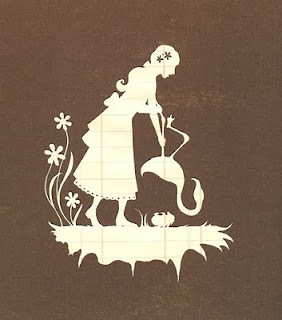 By the way, which "Paper Cuts" book is the tea party in? I definitely want to buy it, but don't know which one! THANKS! I love this! My name is Alice and I am obsessed with dodo birds:) THANKS! I'm still working on drawing them better. that will be sent to Denmark tomorrow, and I think I'll make them all before long. Oh how beautiful! I love the one. The flamingo is fantastic. Thanks so much, I'll be linking. I think possibly the Alice movie will reference quite a few things only those who have read the book will understand, especially since it looks like Alice is a bit more grown-up in these than her original age. Lovely papercut, and I came over from One Pretty Thing! :-) If I get the hankering to play with sharp objects I'll stop by here. I found you via One Pretty Thing - and I'm going to give this a try, my first ever papercut attempt... thank you! Thanks for the lovely template. You need to read the first two books - Wonderland and through the Looking Glass. But if you like films to stay true to a book don't. The film is fab and so are the books. This is so cute! Thank you for sharing! I've never done papercutting before, but I've wanted to give it a try. And I love Alice in Wonderland so this is my time! Today I posted an netry on my blog with a link to this tutorial/dpwnload. I have never done scherenschnitte but have long admired the craft. I have been stopping by your blog for quite a while now admiring your work... it is incredible. I think I'm finally at the point of giving this a try. Thank you so much for sharing all your lovely patterns. This is an awesome idea, bless you. Cindy, (or any other paper cutters that can answer this question) what do you use to stick the cut outs on to backing paper? I love the designs and I enjoy cutting them out, but I want to use them to make a card or something and I don't know what type of glue to use to stick down all the fiddly bits. If anyone could help me I would very much appreciate it! I have been designing for 15 years and papercutting for 7. I love them both! All images © Cindy Bean 2013. Simple theme. Powered by Blogger.